Dr. Alan Stern is a celebrated planetary scientist and space program executive. He was at the helm of NASA’s New Horizons mission to Pluto, one of the most significant and celebrated space program projects in history. The $1 billion project was completed in 2015 after more than 26 years of advocating for, developing, and flying the historic and trailblazing mission. Dr. Alan Stern’s career in space exploration is extensive and features more than 25 years in space instrument development and a stint in Washington, D.C. as NASA’s chief of all science missions, where he oversaw a record 10 major new flight projects and the implementation of all of NASA’s science research, education, and public outreach programs. Currently, Stern serves as an Associate Vice President at the Southwest Research Institute; as Chief Scientist at both World View Enterprises and the Florida Space Institute; and as an aerospace consultant, whose clients have included Jeff Bezos’s Blue Origin and Richard Branson’s Virgin Galactic. 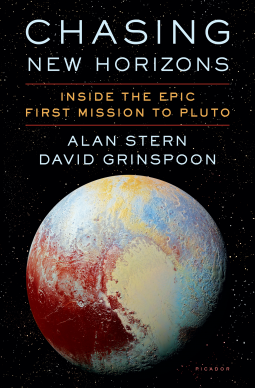 Stern is the co-author of Chasing New Horizons: Inside the Epic First Mission to Pluto, which was published by Picador in May 2018. Dr. Stern is a prolific public speaker who has given over 100 presentations to audiences ranging from business conventions to corporate conclaves and retreats, from universities to science festivals and cruise ships. You can follow Dr. Stern on Twitter or visit his personal website here. On July 14, 2015, more than 3 billion miles from Earth, a small NASA spacecraft called New Horizons screamed past Pluto at more than 32,000 miles per hour, focusing its instruments on the long mysterious icy worlds of the Pluto system, and then, just as quickly, continued on its journey out into the beyond. Nothing like this has occurred in a generation—a raw exploration of new worlds unparalleled since NASA’s Voyager missions to Uranus and Neptune—and nothing quite like it is planned to happen ever again. Told from the insider’s perspective of mission leader Dr. Alan Stern and others on New Horizons, Chasing New Horizons is a riveting story of scientific discovery, and of how much humans can achieve when people focused on a dream work together toward their incredible goal. Twenty-Six Years To Pluto and New Horizons: How Persistence Pays In Life When the New Horizons mission reached Pluto in 2015 at the far frontier of our solar system, it had been over 26 years since mission leader Dr. Alan Stern first approached NASA to fly a mission to planet Pluto. In this engaging and oftentimes funny presentation, Dr. Stern describes the long and difficult road from idea to launch, fraught with setbacks, and the equally long and sometimes heart-stopping journey across the solar system. This epic tale of persistence and personal perseverance by Dr. Stern and his team will motivate public audiences, business groups, professional societies, corporate teams, and schools to higher achievement in their own lives. To the Everest of Planetary Exploration: How The United States Has Trailblazed the Solar System From Neil Armstrong’s first step on the Moon, to Mars rovers, Mercury orbiters, to when NASA’s New Horizons mission to Pluto arrived in 2015, the United States has led a historic era of planetary exploration unparalleled in history. Dr. Alan Stern describes this sweeping age, its historic and geopolitical import, and the most important scientific discoveries it delivered. He emphasizes the ways this has touched people around the globe, and how it shows America on our game in the 21st century. He then looks forward into the future, on what lies ahead for both the robotic and human exploration of the solar system. Why Pluto Sure Is a Planet, And Don’t Let Anyone Tell You It’s Not! NASA’s New Horizons probe was the first spacecraft to explore Pluto and its atmosphere, surface, and system of moons. In this presentation, New Horizons mission leader Dr. Alan Stern carefully and engagingly describes why those who kicked Pluto out of the list of planets were wrong, how planetary scientists are increasingly coming to see Pluto as the first and now best known of an important new class of planet, and how personal biases fooled astronomers into making a very clearly unscientific definition of planets that many now regret. My Suborbital Life Dr. Alan Stern is slated to perform experiments on a series of five suborbital spaceflights aboard spaceships built by Virgin Galactic and XCOR Aerospace in 2018-2019. He’ll describe the coming era of widespread suborbital tourism and research, the missions he’ll be flying, and how you can afford to fly in space yourself! Nine Practices and Lessons in Leadership and Management from the Exploration of Pluto New Horizons, which explored Pluto in 2015, was a billion dollar project involving over 2,500 people and setting records for lean costing and rapid development in space flight. Every business executive, aspiring executive, and business student can learn and profit from the practices Stern and his team used and refined in one the most epic scientific projects ever undertaken. Stern describes how persistence pays, how to choose an A-team for the long haul, how to solves problems, and how to communicate clearly, with examples from the development and flight of New Horizons. "Alan’s experience and passion makes our new age of space exploration and discovery compelling to everyone. His deep knowledge from many successful missions, capped by the incredible fly by of Pluto, make him the finest public speaker on science alive today." "Alan gave out Joseph Henry Lecture to a full house at the Cosmos Club in Washington, D.C. this year. His presentation on New Horizons and Pluto was exceptional and inspiring. Alan has a rare ability to communicate not only his personal experiences in bringing New Horizons to life, but also the technical challenges and scientific rewards of the program. He held the attention of a very diverse audience - from high school students to seasoned NASA scientists - throughout his very well illustrated lecture, and he was incredibly generous with his time afterwards, answering questions and joining the audience for further discussion afterwards. We all came away with a deeper appreciation for New Horizon and a greater understanding of Pluto and the Kuiper Belt. We could not have asked for a more interesting talk or a more personable speaker." "Alan Stern is in the top league of professional speakers in the field of planetary science. His captivating talks not only engage the audience but invite them on a journey through research and discovery. Dr. Stern’s lecture skills are brilliant and personable- he connects with everyone. Without a doubt, one of the best speakers available." "Alan Stern matches a remarkable record of leadership and scientific research with an authentic passion for sharing the excitement of space exploration. In his riveting keynote presentation at the 2015 Flagstaff Festival of Science, he took the audience on a behind-the-scenes tour of our solar system, culminating with the historic flyby of Pluto by New Horizons, a project which he led. He wove together a tale fraught with challenges and intrigue and showed how people can achieve their dreams given healthy doses of grit, hard work, and conviction. This inspirational program left the audience energized and wanting more, and demonstrated why Time Magazine recognizes Stern as one of the world’s 100 most influential people."